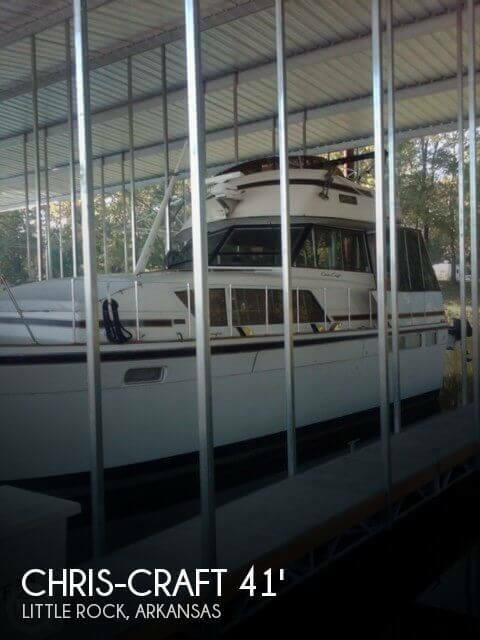 As you can see by the pictures, this 1976 Chris-Craft 410 Commander is in good condition but is in need of a good cleaning. Per the seller, everything is in working order and ready for the water. The owner is only selling because he does not use it anymore and it needs a good home. Stock #136164 Never been in salt water! Includes new bimini and radar! If you are in the market for an aft cabin, look no further than this 1976 Chris-Craft 410 Commander, just reduced to $34,900 (offers encouraged). This vessel is located in Little Rock, Arkansas and is in decent condition. She is also equipped with twin Chris-Craft engines that have 836 hours. Reason for selling is health.